Is your trashcan cleaning business getting the amount of referrals you want? Getting new business is a constant struggle for many small companies and the trashcan cleaning industry is no different. If you want more leads and more referrals for your business, follow the simple steps below and you will start seeing an increase in business and more awareness about your service. The number one, easiest way to generate referrals for your business is to provide consistently good service. It sounds simple, but it’s true; better service equals more business. If you are giving your customers good service, they will tell their friends and neighbors about it and your business will grow. Second, give incentives to customers who refer people to your business. It can be anything from a free week of service, a discount off of their bill or anything else you can think of. Customers like freebies and they are sure to talk about them. Here is one that a lot of small business owners don’t think of; just ask. Ask your customers to refer you to their friends and neighbors if they like your service. There is nothing wrong with asking for referrals and it doesn’t cost you a thing. If there are complementary businesses in your area, partner with them. You clean trashcans, partner with the guy who empties them. You could even partner with lawn service contractors or home repairman. In fact, you can partner with anyone who is out in the community that you serve. Although you don’t want to sound like a used car salesman, try networking. This method is a bit more tricky but can be done almost anywhere and at any time. Get out and mingle, mention your service and see who bites. 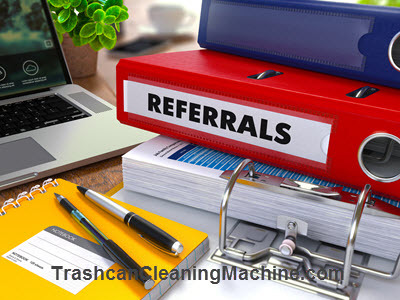 These are all very good ways to gain more referrals for your business and can help you grow your trashcan cleaning service and become more profitable. Take a look at what you are doing already to gain referrals and if that method is effective. If it isn’t, don’t focus too much of your time on it and find a method, or methods, that work for you. Receive the 1st Chapter of my eBook FREE: Where There’s Trash, There’s Ca$h!! I will NEVER rent, sell or trade your personal information. This is a spam-free zone! As a professional businessman and entrepreneur, Wayne Wright’s storied career spans decades of successful roles from independent, one-man operation at 12 years old, to head of one of the country’s leading trashcan cleaning companies. Wayne Wright has changed the face of the cleaning industry many times over and his solution to dirty trashcans was arguably his most important. Are Your Trashcans Breeding Grounds for West Nile Virus? Can Your Trashcan Make You Sick?